The requirements for a successful movie mashup really depend on the ultimate goal of the one doing the mashing. Maybe you’re looking to prove two different movies are actually the same movie, so you match them up beat-for-beat like this Avatar/Pocahontas mashup. Maybe you’re aiming for maximum comedic effect, so you pick movies from opposing sides of the quality and genre spectrum, like The Wizard Of Oz and You Got Served. Or maybe you just realized Harrison Ford was in two movie franchises and figured that’s a good enough reason to edit them together. 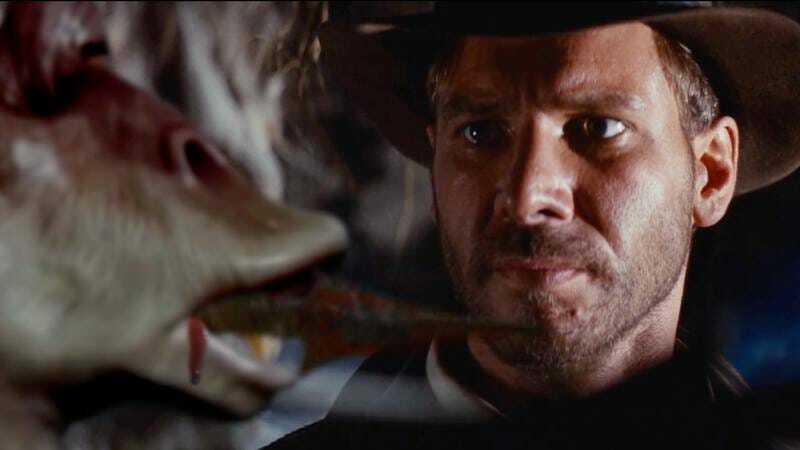 That seemed to be enough for French filmmaker Fabrice Mathieu, the creator of “Raiders Of The Lost Darth,” a mashup of (you guessed it) the opening scene from Raiders Of The Lost Ark and various aspects of the Star Wars franchise. The resulting six-minute short oscillates between convincingly cool and glaringly absurd moments. The broken-down droids and Ewoks in the jungle don’t seem too out of place, but watching Jar Jar Binks get stabbed through the head with a spike is less satisfying than it sounds. This is actually a slightly improved update to a video Mathieu released last year called “Raiders Of The Lost Dark” and includes a few more of the special effects moments. Now that he’s put the finishing touches on this project, he’ll likely move on to the ultimate mashup of Regarding Henry and Blade Runner.